EA Phenomic is a real-time strategy video game developer, head-quartered in Ingelheim, Germany, and founded as Phenomic Game Development in 1997. They were acquired by Electronic Arts on August 23, 2006. The team there is currently at work on a browser based strategy MMO called Command & Conquer: Tiberium Alliances. Here at CNCNZ.com we wanted to find our more about this interesting new genre for the Command & Conquer franchise so we managed to arrange this interview. Who came up with the idea for a C&C browser game? The idea has been around for a long time, I don’t think anyone can really claim credit for being the one who brought it up. A lot of different ideas have been discussed over the years, but now the time seemed right and the technology progressed far enough to turn it into reality. How long has Tiberium Alliances been in development? Depends on what you call the start of development. We have started working on the concept almost two years ago, did some prototyping, but it wasn’t until February 2011 that we put a significant team behind it. What hurdles have you encountered during the development of Tiberium Alliances? And how have you overcome them? When taking a brand to a new genre the biggest challenge is to preserve the essence of the brand in the new environment. MMO strategy games are traditionally about build queues with hour-long build times, long movement times for armies, spread sheet like battles and a focus on empire building. We think that a C&C MMOSG needs to be way more direct and battle oriented to be true to the C&C spirit, so we challenged a lot of the standard ways of handling things in this genre: Typically in an MMOSG you give orders while you are online and they are completed while you are off-line (build queues, movement times to attack, research queues, etc…). Instead, we wanted the game to “recharge” while you are away so everything is ready for you to dive directly into the action once you get back. The other big challenge was the combat system. We wanted depth in the individual battle and challenges which stay interesting over a long period of time. They should be visually rewarding and pay respect to the cool units of the C&C universe. They should provide the satisfaction of wiping an enemy base. At the same time it is important for us that these battles even work when played on a smartphone (a special frontend of smartphones is currently under development). And it should be possible to leave the game at any given time (e.g. because you have to get off the bus) without too much of a negative impact on a running battle. We played around with many different approaches that covered the whole spectrum of options, creating paper prototypes and test implementations and eventually found the current solution to be best fitting for the game’s needs. How will Nod be introduced to the game while so many thousands of people are already playing as GDI? Will everything be erased and reset? We want to avoid resets if possible, but we will open up additional servers. Once we introduce Nod it will just mean that everybody who starts fresh on a server is offered the choice between GDI and Nod. So if you want to try out Nod, you would have to start over or start playing on a second server (the next server is already being prepared and will open up soon). Will it ever be possible to own a GDI and Nod base? Not on the same server. Once Nod is introduced, will battles against GDI still be possible, while playing as GDI? Yes. And it will be possible to have alliances which include both GDI and Nod players. In terms of gameplay – how do the factions differ? Will GDI still be the heavy hitters, and Nod be the high tech stealthy squads etc? Some units will have a rough equivalent in the other faction, while other units will be unique. They will be researched in a different order as well, leading to different play styles at different phases of the game. Will the Forgotten be playable sometime in the future (that is, after several major patches)? We got a number of other big features in the backlog that we want to introduce before we get to the point of considering this. Are there any new units and/or similar units from C&C 3, super weapons like the Ion Cannon and Temple of Nod (nuclear missile) or any support powers? We plan to expand the game step by step over the coming months. Before we get to the point of potentially adding additional units/super weapons/support powers we will first focus on the existing units and ways of upgrading them through research. For new players who have never played a micro-transaction-game-free-to-play-browser-game before, what are the sorts of transactions that we will be paying for? In most games players that are able to spend more time with the game have lots of advantages. Our monetization will focus on allowing players that cannot invest that much time to stay competitive by investing a little money. You will for example be able to increase you storage for command points making you a little more flexible in when you use them. If you would allow us to get technical. As a browser game what is the target audience, target logins per day, target sessions per login? Age wise we are currently seeing that most players are in their twenties, but also a large number of players which are 30+ and still a relevant number which is 40+ (which fits nicely with the age-distribution in our dev-team btw. 😉 ). Our goal is to allow the player to play the game whenever he has some time left that we would like to fill with strategic challenges. Currently we are measuring an average of three sessions per player per day. The current closed beta server has slots for 25,000 players. The next closed beta server will open up soon and will be able hold 50,000 players. What server hardware is Tiberium Alliances running on? We want to prevent cheating through client manipulation, so all player actions are verified by the server, just as all battles are calculated not only on the client, but also on the server. So when can we expect the game to be out of the beta stage and moving on to a full public release? Browser games usually do not follow the same type of steps to launch like a boxed title. We have a number of measures for the quality of the game (e.g. how many players are still active after x days) and the player behaviour (e.g. how fast do players progress, armies from how many different cities do they use etc.). We proceed to the next stage as soon as these numbers are in line with our goals. So far we have made good progress: stability, load and stickiness will allow us to move to the next stage soon: A new server will open up shortly and we’ll let in a large number of people to put some serious stress on the servers. After that we have to test monetization and its impact on the game. It is not until then that we consider moving to open beta. Finally, are there any last comments you want to share with fans about Tiberium Alliances? First of all I would like to thank all the closed beta players. We know how it feels if you just balanced your economy nicely and created your perfect army and then along comes the next patch which messes with all those values. But being able to watch how you are playing the game and reading your feedback really helps us optimize the game. Next up a word to all those who signed up and did not get into the closed beta yet: Thanks for your patience. We need to expand the closed beta step by step and react to the learnings of each phase before it makes sense to let in new players. We’ll open a new server shortly and will give out a significant amount of keys along with that. 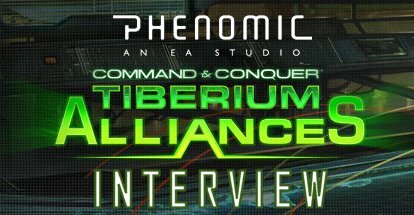 For more about Command & Conquer: Tiberium Alliances, you can check out the Command & Conquer: Tiberium Alliances section here at CNCNZ.com or visit the official site at www.tiberiumalliances.com.